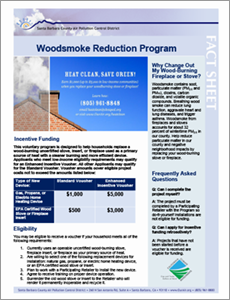 The Woodsmoke Reduction Program is accepting applications for a wait-list to receive vouchers if funds become available. This voluntary program is designed to help households replace an uncertified wood-burning stove, fireplace insert, or fireplace used as a primary source of heat with a cleaner burning and more efficient heating device. Last year our program replaced more than 30 wood-burning fireplaces or stoves. 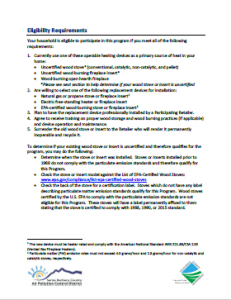 The current 2018/2019 program offers vouchers toward the purchase and installation of a natural gas, propane, electric, or EPA-certified wood-burning heating device. Click here to see data table. The new heating device must be installed by a participating retailer or their licensed contractor and meet local fire and building codes. Do-it-yourself installations are not allowed under this program. Read the Eligibility Requirements and confirm eligibility. 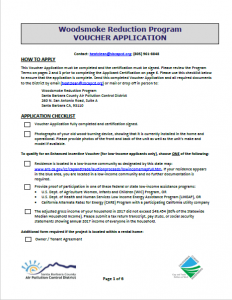 Complete the Voucher Application including photographs of the current heater, proof of low-income (if applicable), and the Owner Tenant Agreement (if applicable). 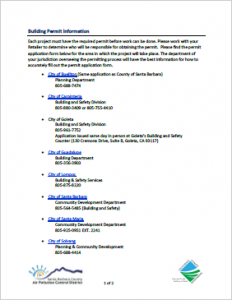 Send completed forms to the District by email at [email protected], or mail or drop off in person to: Woodsmoke Reduction Program, Santa Barbara County Air Pollution Control District, 260 N. San Antonio Road, Suite A, Santa Barbara, CA 93110. After we review your application, you will receive a voucher to be used with a Participating Retailer within four (4) weeks from issuance. Do not begin work until you receive the voucher! Vouchers will be accepted by Participating Retailers at the time of sale and applied as a discount. 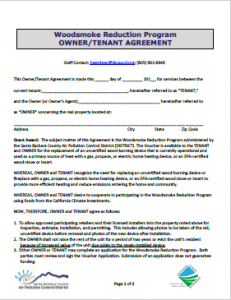 A Building Permit or comparable permit for your jurisdiction is required for each installation. 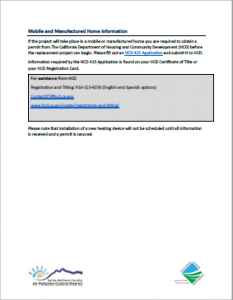 Installation must be completed within 90 days of purchase. 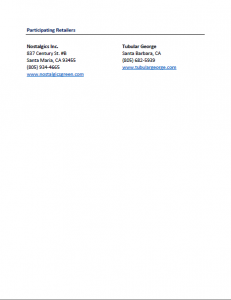 Please contact us at (805) 961-8848 or at [email protected] with any questions you may have. The Woodsmoke Reduction Program is a part of California Climate Investments, a statewide program that puts cap-and-trade dollars to work.